Introducing moon phase patina dark! moon phase patina is the reference execution of Ludwig Oechslin’s modern moon phase watch. Its high-contrast indices and hands make for a highly functional wrist watch. But we wondered what would happen if we put maximum emphasis on the moon phase and date (2nd of the month in the picture) by turning down the volume on everything else. The result was a watch where the time is still readable — if that is why you looked at your watch. Otherwise, a quick glance to your wrist offers the perspective of a longer time horizon. The absence of a second hand adds to the calming — or perhaps energizing — effect of this perspective. 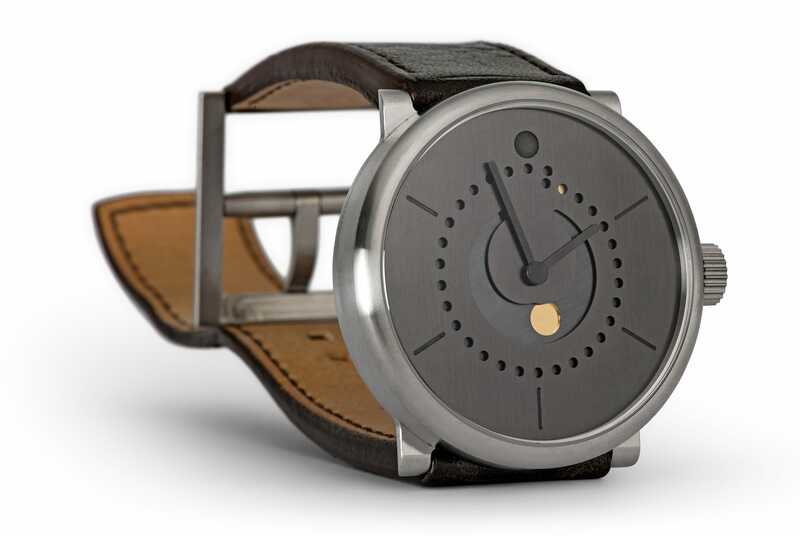 Like moon phase patina, moon phase patina dark’s dial is executed in a single metal — brass — with no color added. Just two metals are visible on the watch: titanium (case, crown, buckle) and brass. The dial and indices are hand-patinated, and contrast is achieved by milling out the moon and date dot at the final step. Peter Cantieni performs all machining and milling at his workshop in Hinwil, and also performs the patination process by hand.